The first thing you'll spot is the quality. Ruggedly precise is the best way to describe the Leica APO-Televid 65mm Angled View Spotting Scope. It delivers images that are sharp, bright and crystal clear from a distance and even in poor lighting situations thanks to the innovative APO-chromatic lens system and Fluoride Glass for superior resolving power. The large 65mm front lens will bring small details into focus even in poor light conditions thanks to the smooth mechanics of the Dual Focus System that controls both rapid and fine focus. 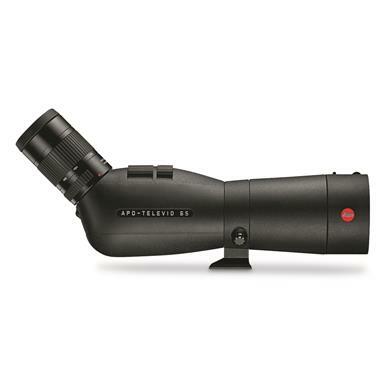 When nature offers different conditions, the Leica APO-Televid 65mm Angled View is built to work in all of them. Whether it's the wind and rain of the seaside, the unforgiving cold of arctic temperatures or dry desert climates, a durable magnesium body with rubber armoring and AquaDura® coating on the lenses means that even when the rain falls, your spotting scope won't fail. It's compact so you can take it on long treks to view a wide range of subjects or mount it on a tripod for extended viewing. The nitrogen filled interior prevents internal fogging to give you a spectacular viewing experiences in any situation. No detail is overlooked in manufacturing a Leica Spotting Scope so that you can see every detail in focus when you use it. Fluoride glass ensures very low dispersion and better correction of aberrations for an impressively natural viewing experience. Dimensions: 11.8" x 4.3" x 3.3"d.